Steelhead angler effort over the past week on the upper Salmon River was similar to what was observed the week before. Effort upstream of Salmon in location code 17 increased slightly, but once again the majority of anglers were seen downstream of North Fork in location code 15. Catch rates improved in all areas this week, and steelhead were reported caught in all surveyed location codes. 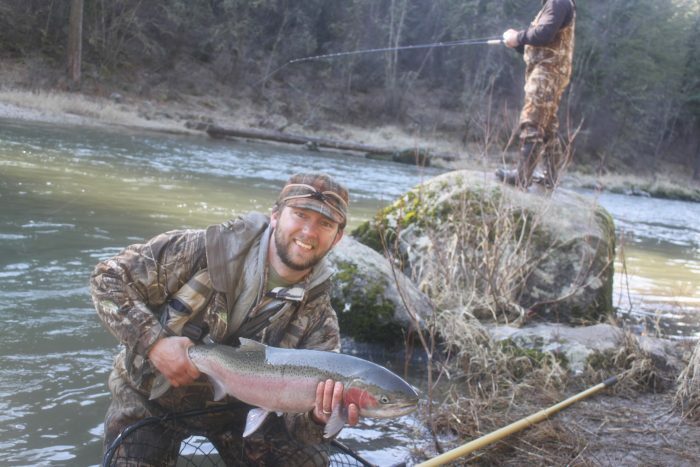 Anglers interviewed downstream of the Middle Fork in location code 14 averaged 14 hours per steelhead caught or kept. Upstream of the Middle Fork in location code 15, interviewed anglers averaged 29 hours per steelhead caught and 76 hours per steelhead kept. Upstream of the North Fork in location code 16, interviewed anglers averaged 27 hours per steelhead caught and 71 hours per steelhead kept. Upstream of the Lemhi River in location code 17, interviewed anglers averaged 5 hours per steelhead caught and 21 hours per steelhead kept. Currently the Salmon River is flowing at 1,410 cfs through the town of Salmon, ID which is 106% of average for today’s date. Even with rain in the area over the previous few days, river conditions remained good on Sunday. River temperatures have started to drop and over the weekend, they were in the mid-40s.